Hellgate London (18h) - VRBones, 13 Engineer. The trip up to Matt's place meant new games to see & play. The only thing that was of interest though was hellgate London. Supposed to be like diablo, but plays more FPS. It seems Ok to play, but not gripping. Played single player though to ~13 to get the feel of the Engineer as I wasn't impressed by the subscriber model for playing online for the elite levels. Hopped online to playu a little with Matt to see if it was more entertaining. Didn't add much in the way of tactics, but it added another dimension to the fragfest. The game needs buddies and and beer to make it shine. Football Manager 08 (10h) - Barrow, 17th EC, Season 2. Back into it mainly due to the lack of options at the moment. Played a lot of things but none gripping enough to keep me going. Europa Universalis III (8h) - Played through some of the Irish provinces to see if I could hold England back and unite Ireland. Did it on the 3rd go as Munster. Medieval II: Total war (3h) - Scotland now has William Wallace and a whole horde of henchmen from the north to pound the English. I"m not done with the Vikings yet, so it'll be a wintery Wallace for a while. Facebook Poker (1h) - 11147. Mixes well with other turn based games. Medieval II: Total war (14h) - Got into the Britannia campaign as Scotland. It plays almost identically to Rome: Total war, so I'll probably do a bit more then try another campaign writeup like the History of Briton one from the RomeTW series. TF2 (10h) - Still hooks me in (like to 3am christmas eve), but just less times I'm starting it up. Battle for Wesnoth (10h) - Finally settled on Wesnoth for a multiplayer game when Ben came over. We'd been discussing what types of games we wanted to try, but most of the games I had weren't actually multiplayer in the sense of true LAN. Most sent people online first. Civ 4 was another option, but my copy is munched. Wesnoth served its purpose though. Later I played a bit more of the custom scenarios to get back into the swing of it. Halflife 2 (6h) - One uneventful night I thought I'd try something different and give the HL2 campaign a go. It did have a good feel to it, and even though it's incredibly linear it did a good job of hiding it. I also liked the pacing. Parts are hectic non-stop run&gun, then either a commentary section or a semi-puzzle to figure out how to get to the next room. The raven aarea is leaving a sour taste in my mouth though, I'm not big into the horror stuff and it detracting from the game. May or may not play any more, but I'm intrigued by Force's recommendation that the ending of HL2: Ep2 is a cliffhanger. Uplink (3h) - Managed to store the link path so it was easier to play again for a while. Want to get into some more interesting missions as the ones at the moment are getting stale. Football Manager 08 (2h) - Barrow, 15th EC, Season 2. Played enough to pull out the coaching data. Losing interest and other games crowding it out. After playing a stint with Arsenal for the coaching it'll be a long road to get to that status. Europa Universalis III (2h) - Another one pulled out to see whether it's LAN multiplayable. Trackmania Nations (2h) - Another one for the LAN and a few races for Cameron. 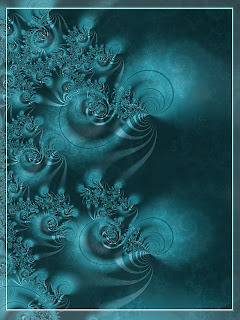 Facebook Poker (2h) - 11027. Mixes well with other turn based games. 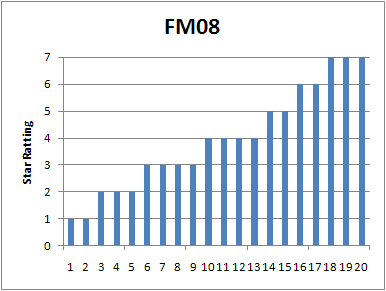 Back in FM07 I dug up the 5 star coach rule and deduced a function to calculate any star rating. This was really handy for LLM clubs where getting a 5 star trainer wasn't much of an option. 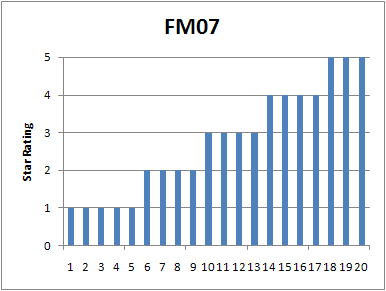 After looking at the new FM08 7 star ratings, it was identical to the original 5 star system to get the top tier, but was it the same formula? Unfortunately the new 2 stars are 'additions' to this basic structure to give more definition at the start and end of the spectrum. There is an additional break between a 1 & 2 and the slightly better 3,4, & 5, as well as more definition at the top end by dividing 14 & 15 from 16 & 17. 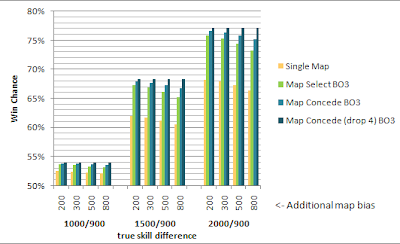 As before, replacing 'M' with '(M*4+S)/5' at each point gives the star ratings for training areas requiring a secondary attribute. For Set Pieces it has 3 attributes, but it's simply a replacement of 'M' with '(M*3+S+T)/5'. Eventually I dumped the formulas in favour of an Excel lookup to get rid of a 0 star rating at 1 skill which kept making the output look untidy. I could have added another int() division to take care of it but the formula was stretching it anyway. After singing along to "Still alive" and digging around the net for portal related stuff, the poster I ordered 2 weeks ago turned up on my chair when I got home. 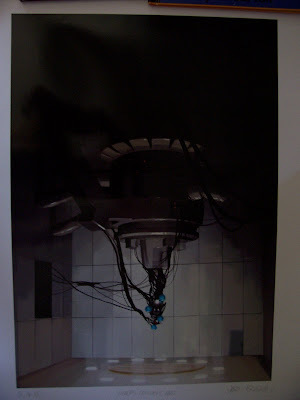 Valve released a limited edition of signed lithographs for Portal, TF2 and HL2 a few weeks ago and although I wanted the TF2 one, the picture just wasn't that interesting. The Portal one of GLaDOS seemed to work well and looked like it would be a good candidate for the collection. 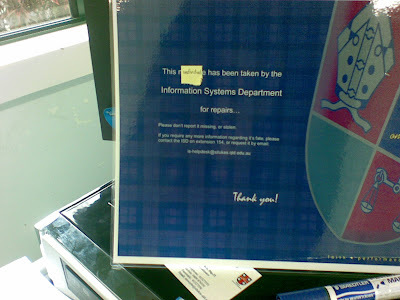 It also came with a rather tacky authentication certificate, but the gloss print and the signing was worth it. For the record I got number 35 of 100, and seeing I went straight to the store after the announcement I guess they sold out rather quick. Went back to the site on Monday and they weren't even selling the ordinary lithographs anymore [Edit: now they are]. Should make for a good investment as one of the best moments in gaming. For all the poo-pooing of Steam, it was a morning update message that alerted me to these being available. So all the pestering actually did get more money out of me. GG. *Bonus cupie doll for picking up the name of the book holding the lithograph flat or finding the ghost in the machine. I dug up an interesting "Still Alive" diagnosis for portal that postulates a split personality for GLaDOS and that all the stuff she said was true if you take this into account. I like it. A lot of the offhand comments from GLaDOS support a fragmented personality if viewed externally rather than accepting that GLaDOS is toying with you. Incredible Wiimote Hack Creates Multitouch Display: "Using a Nintendo Wii remote and some software that he ginned up himself, Johnny Chung Lee of Carnegie Mellon University took a few ballpoint pens, replaced them with IR lights, and presto! Since the Wii tracks IR lights, Lee found that practically any surface -- a projector screen, a tabletop, an LCD screen could be turned into a multi-touch screen "
We use a lot of interactive whiteboards here at school, but this technique seems more useful and easy. Multipoint looks amazing. 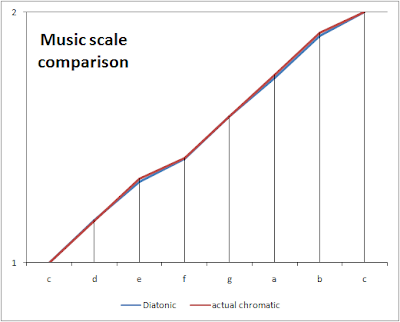 Intrigued at the chromatic equidistance alignment to the diatonic scale, I whipped up an excel spreadsheet to calculate the harmonic values and the error. The tonal equivalence is pretty good for the most part, especially locking in G and F as the major derivatives from the C based scale. 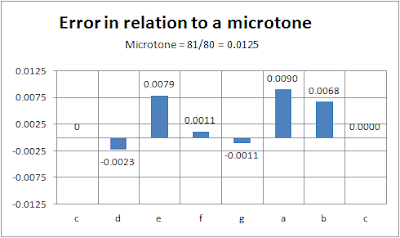 The sacrifice of E, A and B at 1/2 a microtone are on relatively large dissonance valleys, so it should 'sound' Ok compared to losing a G.
A while back Matt Farthing had offered to teach a bunch of us how to play the guitar in the School lunch break. It eventually dissolved once we were past he basics, but I did have a chat to Matt about the musical scale and he mentioned something I wasn't familiar with: "each note on a keyboard rises one 1/2 note counting the sharps". This led to a related problem; where's the sharp key between the B&C and E&F? If the white notes are usually a full tone apart, why does it sound natural going up the scale only playing the white notes? Wouldn't there be a marked difference when you hit F and C? Is this just what we are used to? 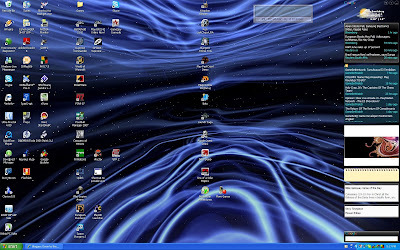 I dug up some stuff on the net, but nothing really got to the bottom of the problem. Lots of music theory, but mostly history or the blanket statement "Here's C, and here's a chord". I then found Jeff's music theory page and a whole lot of maths harmonics clicked in to make sense. I still didn't know what happened to the missing black key, but it shows why there is a discrepancy between the spacing of the notes. It seems odd that the tonal equidistance of the chromatic scale works so well when translated to 2,2,1,2,2,2,1. Found this as someone's sig. TF2 (19h) - [QGL] won 3-2 CP_Well match over Drunkards in Combat to vault us into 16th on the ladder. Facebook Pirates (1h) - Level 7. Found one guy that kept fighting back each time I attacked him, so that made the push to level 7 a little more interesting. Command to unlock dual core support? Doubles frames! - Gamers Underground: "mat_queue_mode 2"
Finally got round to pushing the last couple of games to the end of the season. I had some good talent brought in on loan, and Hadji mid-season set the formation for the remainder of the season as 5-3-2 with a counterattacking style. I'm impressed by the new version of 5-3-2 in putting the midfielder on attacking runs too. You can flood the box easilty with 5 man crossover runs onto the 2 central defenders. Id have thought it would cramp up but the new engine keeps the guys active. It's not a goal frenzy for the AttMid either. Lots of lovely passes from all 5 players with ample space for the wing backs to cross in. As in FM07 it has problems with a DMid formation, or another 5-3-2 box, but I couldn't get my usual 4-3-1-2 working at all. TF2 (13h) - [QGL] won 3-2 on 2Fort with me top scoring. Football Manager 08 (13h) - Barrow, 1st ECN, Season 1. 6 points clear with 2 games to go in the season. Can't wait for the new season to release some deadweight and look for some better talent. The Loans system feels broken for low league clubs. Facebook Pirates (3h) - Level 6. Made up an excel spreadsheet for the odds to attack higher levels. Looks like it's not worth it until level 6. Should make a proper blog on it. Facebook Poker (2h) - Not sure whether to count this stuff, but I'm checking facebook more and more even though is still feels a bit useless. Poker and Pirates are a distraction. StreX has another track ready for download. Mass gave it the thumbs up before the TF2 match tonight, so it's coming highly recommended. I like the idea of an extended set laid down rather than piecemeal sections, and for free too! After a couple of dropouts we finally got our game underway tonight vs ACSSL. Started pretty rosey with ET & me wiping out the initial rush, but only left me standing with no medics. I scouted their base enough to spot & take down some engies setting up position, so we pushed through next spawn. 1-0 to the good guys so we wall up for a bit. Rubba's positioning of teleporters, turret & dispenser was causing a lot of havok for their attack, but they countered with double spies to break through. The malleable defense of soldiers and demomen kept them out though. We ran another couple of sorties, but without the extra defense we traded caps for 2-1. They set up a defensive turret in their flag room to keep the single pushes out, but we were locking down again. They had problems with a player dropping, so that also helped out a bit. Though the final minutes we succumbed to a big push, but had also penetrated the turret defense to nab one ourselves. I stayed back at their flag room to kill the sole medic returning for the cap and managed to hold off a few more before they got through. 3-2. The final seconds tick down and we're feeling in control. They are taking down our defensive sentry with ease, but we've got too many bodies in the way to let them through. 3-2 final score and we're happy with the effort. TF2 (11h) [QGL] won 4-0 on 2Fort. Far more comfortabe on that map. Next week has us defending against ACSSL again on 2fort, so I'm pretty confident. Might even play this week :/. Football Manager 08 (9h) Barrow, 2nd ECN, Season 1. Out of all cups so it's now a race to the endo of the season. We placed higher than expectations on all cups, but Hadji breaking down with a thigh strain sealed our fate in 2 of them. Yu-Gi-Oh! World Championships (8h) - Trawling through the DS games looking for something playable. The game feels a little tight, with no real access to a lot of information you need to make the game play. Well that's not entirely true, the info is there, it just isn't in a very presentable format. The card game itself looked a little simple with essentially no casting costs, but the overplay on top of the basic cards is what makes it involving. I like the challenges, but I don't know how to get past level 1 in the duels (played ~20 duels) :/. When I was at Uni, I used to describe the residential college experience as unique. It's like shoving 18-25 year olds onto a cruise ship. Well, as it happens, the Scholar Ship is just that! Pokemon Diamond (17h) - The DS is becoming a system I'm using more and more since you can just jump into the game where you left off with a minimum of fuss. Diamond is playing a lot like emerald at the moment :/. I've been spoiled by Puzzle quest, Zelda and Brain age utilizing the pen for virtually everything and it's wierd going to a game that is predominantly keypad. Intuitive interfaces FTW! TF2 (9h) [QGL] lost against Hyphen gaming. Once I saw kinnear in the hyphen squad I knew we were in trouble, but Steam is what really killed the game. Football Manager 08 (6h) Barrow, 10th ECN, Season 1. Tough section ahead with cup matches cramming up the schedule. At least the rotation players are getting a go. Legend of Zelda: Phantom Hourglass (5h) - It's hyped up enough to get me into trying it out. Puzzle Quest (1h) 26 Druid. Brain Age 2 (1h) Morning wake up. FIFA 07 (1h) Competitive Computer Games @ St Luke's. For Sandy's birthday I decided to do something about her internet presence. She had been using my hotmail account for mail and steck trading signups and didn't really see the need to get her own account. The trouble is that there is more then just an email to build an online presence. Many sites require an email as a 'starting point' and frown on using the same address for more than one account. This rules out any chance of me and sandy using the same forum or social networking technology unless I used another email account when signing up. Since I usually jump on to test things first I'm used to using my hotmail account as a throwaway rego and spam account rather than thinking to the future. The real solution was to get Sandy her own email account, and from there expand to MSN messenger, Facebook and of course, a blog. While I was in the mood for setting things up I also took the time to get a couple of website names locked down. - bowesclan.net (and bowesclan.com) will hopefully be a blog for all of the family to contribute to since no-one else has a blog. 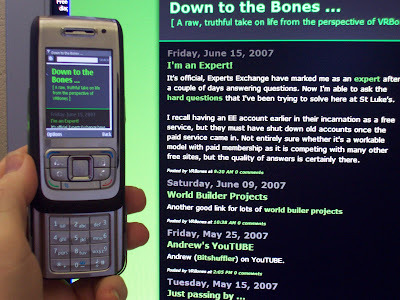 - VRBones.com will be the new name for this blog so I can move it if need be. Hopefully I can syndicate this feed onto bowesclan too. - vrworlds.net will be for the PhD stuff, but probably pointing back to this site until I get it in place. - tonybowes.com is locked away for a rainy day, but I doubt I'll need it as vrbones.com should suffice as I've used VRBones everywhere, not Tony Bowes. - cameronbowes.com is also locked away in anticipation for Cameron's online emergence. GoDaddy offered additional privacy for bulk purchases, so that got a couple more bucks out of me to get the last couple. Should be worth it in the end. on Thursday I finally get into a clan match. Hop on 1/2 hour early to play a couple of warmups and get Ventrilo set up. Inside the server itself it's fine until a minute before it goes live when there's wierd lag issues. Teh game starts and I'm seeing almost everyone running around as scouts or heavies. Obviously they aren't because 1/2 of them are shooting rockets at me. The doors on Well are also stuffed, showing a seethrough backface of the door model instead of a shut door. I log out and relog and it's still stuffed so I play 1/2 the game like that. We're down 0-4 so I relog again, this time fixing the model and lag issues. We stop the rot at 0-5, but the damage is done. After the game I kill TF2 only to find a happy Steam update screen telling me that there's a new update that it happily downloaded while I was playing, as well as a new game coming out that you're sure to want me telling you about. AAAAAARRRRRGH!!!!! Steam, get the hell off my computer. Just leave it alone. I don't want your popups, I don't want your automatic downloads, especially for games I'm not playing anymore, and ESPECIALLY WHEN I AM PLAYING A GAME! You are supposed to make my gaming time enjoyable, not ruin it. This hasn't been the only time either. I have had it update 3 times when I'm playing other non-steam games. I could have excused it for not knowing that I'd be wanting to use MY computer outside of its little steam world, but an update in the middle of a TF2 session, for TF2 (that couldn't possibly be applied until I finished anyway). Whatever happened to the common courtesy of asking if I would like to download it before you kill my bandwidth and processor. I had a dig around the settings (3rd time doing so) and finally found an option to turn the auto updates off. Or so I hope. There was also an option to turn off the daily ads they keep ramming down my connection, but it doesn't work. I swear I'm gonna throttle some valve developers if the autoupdate removal option dosn't stick. There are still issues with the friends system not giving up-to-date status information (If you're telling me they are in the game, they should be in a game, not offline 1 hour ago) and the join friend's server option just doesn't fit well with TF2's full server problems. If there was ANY way to play TF2 without steam I'd uninstalll it in a flash, even forgoing Half life2 if need be. Just .. please .... go away. Mongie made up a forum for us all to .. err .. discuss stuff. More vanity googling led to an old AusGamers review of Total Club Manager. Looks like it was the height of comma trade where every sentence wouldn't be complete without a comma or 4. TWiT made me join Facebook to see what it's about. 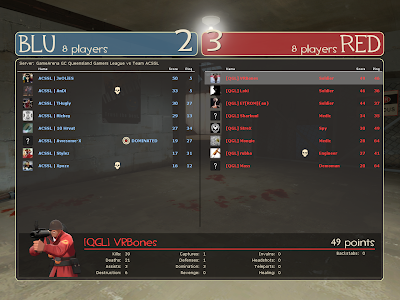 TF2 (17h) 42 points with soldier. [QGL] played and won a tense game over McOhnd. 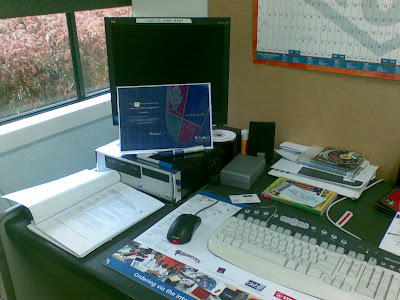 Football Manager 08 (15h) Barrow, 8th ECN, Season 1. Still in 8th, but have played nothing but cups for a month so I'm 3 games in arrears. 1 win away from 4th, so I'm not too fussed. Picked up a neat purchase in the form of a moroccan international happy to play at my level. We made it through Shrewsbury with a 2-1 win away from home to book a 3rd round spot in the FA cup. We're still in the other 2 cups too, so it looks like another month of cup matches coming up. Brain Age 2 (2h) Morning wake up and when Cameron demands it. Bi-weekly doesn't really feel right for a gamelog. There's a lot that happens in a week, let alone 2 weeks. Might have to knock it back to once a week again. TF2 (45h) I'm starting to get top 3 positions pretty regularly now. GameArena has a league set up for TF2 and is the biggest league in the world so far. Hoping I'll find an oldskool team to join up wif. Playing for 5 hours straight also leads to gamerStink(tm). It's been away for a while, probably since QGL days, but it's certainly shower time after a good sesh of TF2. Football Manager 08 (35h) Barrow, 8th ECN, Season 1. Even though the savegame says I've been playing for 2 days, I think it's counting times when I've left it running in the background while surfing the net or doing stuff around the house. 35 seems more likely. A bit suprising even at that count. I'm only getting into the first season now, probably 1/3 the way through. Even though there was a lot of work starting up the team and reorganising training / staff / loaners / tactics, it's looking like 70hours for a season. Brain Age 2 (6h) Morning wake up and a couple of times when visitors are over. Puzzle Quest (5h) 21 Druid. Kinda guessing at the usage as PQ pops out in the mornings or over at youth for a couple of spare minutes. World of Warcraft (4h) Past level 70 it's feeling a different game. I'll play if Sandy is in the game, but TF2 keeps me more entertained at the moment. FIFA 07 (2h) Competitive Computer Games @ St Luke's. Haven't looked at GameCreate for a while, but happened to notice that the new verion is out of beta. Might be just the shot for CCG. 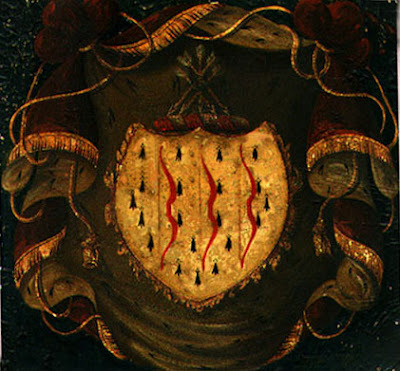 Coat of Arms: "The Arms which he claimed varied between Ermine, three bows paleways in fesse gules." my.stlukes - 3.0: "Welcome to my.stlukes! " Back to it. WCG threw my weekly reflection out of whack a bit, as well as cutting seriouly into game time. It was great to meet up with familiar referees & players, as well as getting an opportunity to meet more from the best in the world. Steam now has stats tracking for TF2 and Portal in 2 week increments, so it'll be easier to make up for a couple of weeks missing by having a 2 week GameLog. TF2 (30h) Still has that oldstyle feel that hooks me in. I love it. Hope it becomes the Grand Unifying Game of all team based FPS. Puzzle Quest (20h) 19 Druid. The flight back gave a lot of time to get stuck into Puzzle Quest on the DS. It's an addicting game and most spare moments I had I'd be playing it. It's actually surprising how easy it is to pull it out, flip the lid and you're in the game immediately. Even a 20 second window would be meaningful enough to pop it out and shuffle a couple of manaballs around. World of Warcraft (8h) It won't go away that easy, but it sure is being neglected. Brain Age 2 (6h) Another pick up on the DS. Sandy and I are using it as a good social wakeup game. Cameron is even in on the action and is demanding 'little poota' whenever it comes in sight. He's got the hang of clicking through the menus with the stylus to get to the drawing or piano game, so that's something I guess. Trackmania Nations (2h) Some after-work destressing when Cameron is around. Otherwise it's straight into TF2! FIFA 07 (1h) New season of Competitive Computer Games starting at St Luke's with FIFA this term. I'm writing the proposal for next year's events and it looks like we might drop to a one game format, with TrackMania leading the vote so far in terms of fun factor, ease of playablilty and ease of competition management. I'm not much of a fan of carmac, he's outspoken and almost up himself. Last year he slammed double elimination as a format in favour of the intensity of single elimination, but then whinges when single elimination doesn't deliver. The thing is agree with most of his points, but for different reasons. He just seems to gloss over critical issues that have much more impact than the surface issues. Found a neat little snippet on the EG forums pointing to a Zero Punctuation review of Orange Box. Awesome. I dug up a couple more of his interviews and he speaks my language in terms of game taste and style. He's from Brissy too, local talent FTW! Study material for FIFA this term at St Luke's.